Anyone who knows me is well aware that I am a huge fan of Anne Rice. I have been since I was 12 years old when my mom gave me a copy of Blood and Gold for Christmas (not necessarily age appropriate, I know, but my mom didn’t, thank goodness). Had it not been for that gift, I may have never had the inclination to write, or pursue writing professionally. This is the impact one author can have on a person. How incredible is that? The first time I read Blood and Gold I was mesmerized by it. I instantly fell in love with the way the book was written, the worlds it transported me to, and the characters it brought to life. Marius was and always will be my favorite character, and I still read this book at least once a year. I felt a connection to the characters that no other book had given me before, and a fascination with history that persists to this day. While I may have been interested in history and the craft of writing before this book entered my life, it was only after I read it that my fate was sealed. What amazes me, however, is that not everyone has felt the same. A quick look at Anne Rice’s Wikipedia will tell you that even talented authors like Mrs. Rice have faced self-doubt and opposition. I still find this hard to believe. How can anyone pick up any of Mrs. Rice’s books and not instantly fall in love? How can anyone bemoan the style of her prose or the construction of her stories? Are they blind? Whether this statement is true or not, it’s hard to imagine that such a remarkable novel could receive such polarizing reviews. Thank goodness she didn’t listen to her critics; otherwise we would have never known Lestat, or Armand, or Pandora, or Marius, or David, or Vittorio, or any of the other characters that she has brought to life. “I wish you every conceivable blessing with your writing. You know, I’m sure that this life is worth the courage and the nerve it takes, the sheer nerve it takes to be a writer. I hope all goes well with you. We have to forgive those who try to discourage us. They are mostly talking about themselves and their own fears and limitations when they tell us we can’t do what we want to do. Take care, and thank you again, Anne Rice”. I read and reread that email every time I feel down and insecure about my writing. If an amazing, talented writer like Anne Rice must face criticism and opposition, then so must we all. There is no way around it. It’s part of being a writer. Sometimes I need to take a moment and remember that in order to keep pushing forward. If Anne Rice had never written her novels, or had given up writing after Interview with the Vampire, I’m not so certain I would be as inspired and determined to write as I am today. Maybe I would have given up when someone told me writing was a waste of time, or that I have no talent. It’s amazing how influential authors can truly be to those that wish to follow in their footsteps. I think that’s something all writers need to remember when they feel like giving up. You might be the one to inspire another. 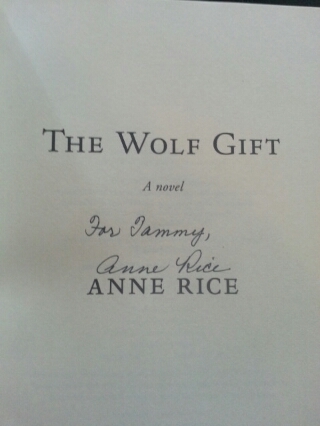 This entry was posted in The Writing Life and tagged Anne Rice, author, fiction, history, novel, rejection, writing.